Patterson in 2014 training camp. Cordarrelle Patterson (pronounced cor-DARR-əl; born March 17, 1991) is an American football wide receiver and kickoff returner for the Minnesota Vikings of the National Football League (NFL). He was drafted by the Vikings in the first round of the 2013 NFL Draft. He played college football at Tennessee. On October 27, 2013 in a game against the Green Bay Packers, Patterson tied the NFL record for longest play and set the NFL record for longest kick return with 109 yards, the longest possible kick return. Patterson attended Northwestern High School in Rock Hill, South Carolina, where he played football, basketball and ran track, and was teammates of current free agent quarterback Justin Worley. He was coached by Jimmy Wallace. As a senior in 2008, he caught 75 passes for 944 yards with 18 touchdowns, leading his team to the State Class 4A Division II championship game, and was named All-state selection. Patterson was also a three-year letterman in track & field at Northwestern. He spent 2009 at North Carolina Tech Christian Academy, but did not play football. In 2010, Patterson transferred to Hutchinson Community College in Hutchinson, Kansas, where he played junior college football and was recognized as a National Junior College Athletic Association (NJCAA) All-American in 2010 and 2011. He holds more than a dozen records at Hutchinson C.C., including career receiving yards (1,832), career receptions (113), career receiving touchdowns (24), career total touchdowns (36), career points (216), career kickoff return average (41.9) and career all-purpose yards (3,379). In 2011, Patterson was a first-team All-American as a freshman, claiming the honors as a return specialist. He totaled 645 yards on 21 combined kickoff and punt returns with three touchdowns, and also recorded 52 receptions for 908 yards and nine touchdowns. As a sophomore, Patterson earned first-team All-American honors on offense and was named the 2011 Jayhawk Conference Offensive Player of the Year after catching 61 passes for 924 yards and 15 touchdowns, carrying the ball 32 times for 379 yards and six touchdowns and averaging 48.2 yards on 10 kickoff returns with three more scores. Patterson also competed in track & field during the spring of 2012, where he clocked personal-bests of 10.33 seconds in the 100-meter dash and 21.19 seconds in the 200-meter dash at the Jayhawk Conference Championship. He also competed in the long jump, and recorded a collegiate-best jump of 6.85 meters (22 ft, 4.5 in) at the Southwestern Invitational Championships. On May 16, the Levelland Meet saw Patterson part of a 4x100-meter relay team that timed 40.32 (season-best). At the Lawrence Meet, he helped the sprint medley 1,600-meter unit time in at 3:28.50. Patterson was a highly touted recruit in 2012 coming out of Hutchinson Community College. Rated as a 5-star prospect by 247Sports.com and the top JUCO player in the country, Patterson received scholarship offers from upper-tier Division I programs. He ultimately chose to attend the University of Tennessee over LSU, Auburn, Georgia, Ole Miss and others. Patterson cited his relationship with Jesus and God as his main reason for choosing Tennessee. Patterson received an athletic scholarship to attend the University of Tennessee, where he played for the Tennessee Volunteers football team in 2012. He made an immediate impact with his athletic ability and offensive versatility. Primarily used as a wide receiver, he also excelled as a return specialist and all-purpose running back. He scored at least one touchdown by reception, rush, kick return and punt return, with 10 total touchdowns in 12 games. In 12 starts, games, Patterson racked up an school-record 1,858 all-purpose yards (set by Reggie Cobb in 1987) to rank first in the SEC, tied for 18th in NCAA. On January 9, 2013, Patterson, along with college teammates Tyler Bray, Justin Hunter and Darrington Sentimore, announced his intention to leave college early and declare for the upcoming 2013 NFL Draft. Patterson was selected in the first round with the 29th overall pick by the Minnesota Vikings in the 2013 NFL Draft in a draft-day trade with the New England Patriots; the Patriots received four draft picks (a second, third, fourth and seventh). In the season opener game on September 8, Patterson caught his first career pass from Christian Ponder for a 10-yard gain and had two kicks returned for 54 yards. In Patterson's second career game against the Chicago Bears on September 15, he scored his first NFL career touchdown by returning the opening kickoff for a 105-yard kick return touchdown, marking the first kickoff return touchdown the Bears had allowed since September 30, 2007. For his outstanding performance on special teams during the month of September, Patterson was honored as the NFC Special Teams Player of the month. In Week 8, Patterson returned the opening kickoff 109-yards for a touchdown, an NFL record for the longest play ever. After Patterson's performance against the Green Bay Packers he was named NFC Special Teams Player of the week. On November 7, Patterson caught his first touchdown pass for 2 yards. On December 1 Patterson ran a touchdown for 33 yards helping the Vikings win in overtime. Patterson's best receiving performance of the season came in Week 14 against the Baltimore Ravens with five catches for 141 yards; in that game, he scored his longest receiving touchdown when he took a bubble screen pass from Matt Cassel 79 yards to the end zone with just 45 seconds remaining in the fourth quarter. In the season finale win against the Detroit Lions on December 29, he scored the final two touchdowns at the Metrodome. The first of them came on a 50-yard run in the first quarter, and then he added an 8-yard reception with 9:19 left in the game. The rushing touchdown set a team record for the longest rushing touchdown by a Vikings receiver. Patterson ended his rookie season with 45 catches, 469 yards and 5 touchdowns. On January 2, 2014, Patterson was selected to play in the Pro Bowl, filling in for Antonio Brown . On January 3, 2014, Patterson was named as a starter on the 2013 "Associated Press" (AP) All-Pro team as the Kick Returner. Patterson suffered through a disappointing 2014 season under new head coach Mike Zimmer and offensive coordinator, Norv Turner. The team drafted rookie quarterback Teddy Bridgewater in 2014, but Bridgewater and Patterson failed to create any chemistry. The second year receiver caught only 33 passes for 384 yards and one touchdown. His return yards also plummeted. Things got worse for Patterson who ended up losing his starting job to Charles Johnson, a practice squad player the team picked up from the Cleveland Browns. Johnson was drafted the same year as Patterson in the 7th round by the Green Bay Packers. By season's end, Patterson went from starter to fourth on the team's depth chart. Patterson had an opportunity to reacquire his starting position after Greg Jennings was released during the off-season. After newly signed veteran Mike Wallace established himself as the starter and rookie Stefon Diggs emerged as a premier receiver in Charles Johnson's absence, Patterson was dropped to fifth string and relegated to return duties. He would receive minimal play at wide receiver throughout the season, only amounting two receptions all season. However he did have two kick return touchdowns, the first against the Oakland Raiders and the second against the Seattle Seahawks . 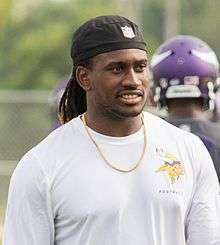 ↑ Cordarrelle Patterson, Vikings NFLPA Rookie Premiere 2013. Pro Player Insiders. May 18, 2013. Event occurs at 0:07. Retrieved December 23, 2013. ↑ Burke, Chris (October 27, 2013). "Cordarrelle Patterson tied NFL record with 109-yard kickoff return". Audibles blog. Sports Illustrated. Archived from the original on October 28, 2013. Retrieved October 28, 2013. ↑ Cordarrelle Patterson, UTSports.com. Retrieved: 18 March 2014. ↑ McGinn, Bob (April 17, 2013). "Tennessee's Cordarrelle Patterson has plenty of talent and question marks". Milwaukee Journal Sentinel. Archived from the original on November 12, 2013. Retrieved November 12, 2013. ↑ "Cordarrelle Patterson added to Pro Bowl roster as a returner". PFT.com. January 2, 2014. Retrieved January 3, 2014. ↑ "2013 All-Pro teams". NFL.com. January 3, 2014. Retrieved January 3, 2014. 1 2 Zinski, Dan (September 7, 2014). "Cordarrelle Patterson 67-Yard Rushing TD". TheVikingAge.com. Retrieved September 9, 2014. ↑ "Minnesota Vikings Kick & Punt Returns Career Register". pro-football-reference.com.